Gosh, more than half a month and this is the first post for September. I deserve to be shot/whipped/blasted out of the orbit. I will not even try to explain myself here, for excuses are aplenty, grandfather stories coming in droves and yet I could talk (or sing) till the cow comes home and does not matter one bit. In fact, I have been on the road (or air) again since 1 Sep until today. Yes, a grand total of 14 days now, and counting. Hong Kong to Singapore, then Kuala Lumpur and Ipoh last weekend, before back to Kuala Lumpur (now) and then to Singapore for the next few days and finally departing (or deported) back to Hong Kong this weekend. 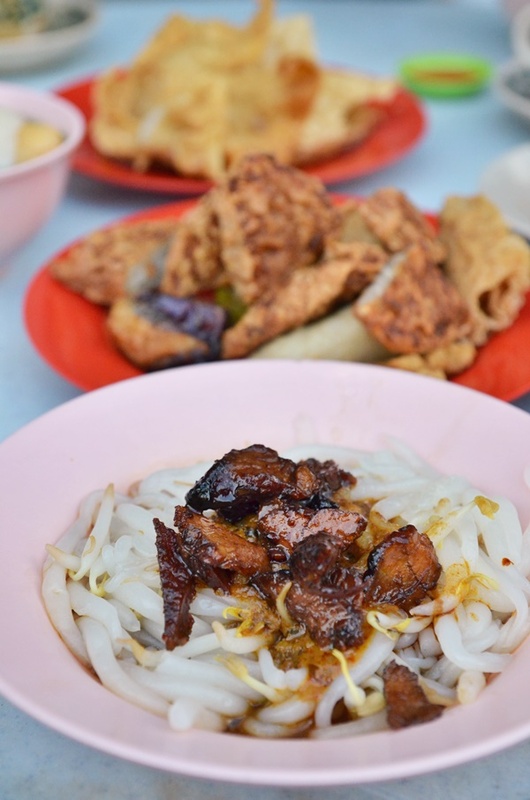 Consecutive meetings are not unheard of, if you have followed this blog since day one when I used to find happiness (don’t give me that face ……) and solace in food finds from the most obscure and unpronounceable location names in Perak. But this stretch I would imagine would top all the past marathons, even the earlier stretch in Italy-Spain. 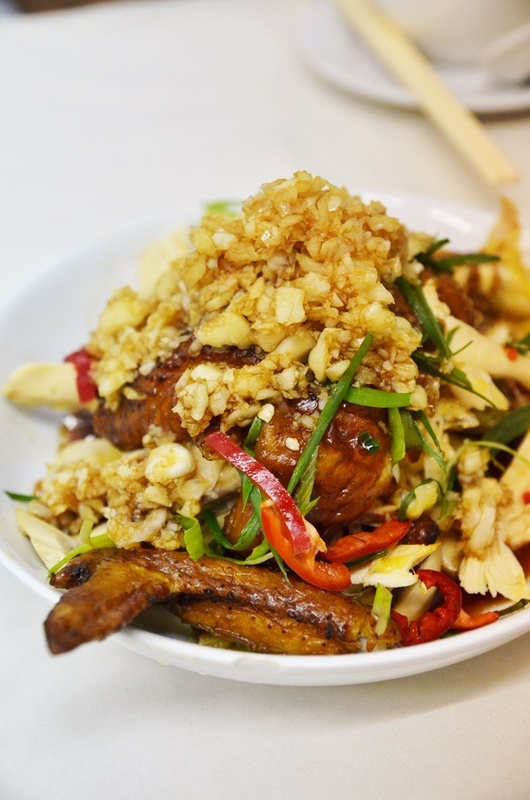 On the flip side of things, I discovered (or re-discovered aka ‘frying cold rice’ – go ask your Cantonese-speaking friend to decipher) several share-worthy eats in Singapore, Kuala Lumpur and of course, my beloved Ipoh. But then again …. On the flipper side of things (haha, sue me language police), traveling light means that I don’t have access to my personal laptop (beats me why I made the decision to purchase a megaton gaming machine from Lenovo that can barely fit into a backpack! ), and blogging is out of the question. Hence, the next best alternative is to share them through social media – and this ultra late adopter of Instagram did just that over the past weeks. Yes, finally I have signed up for an Instagram account (thanks to continuous peer pressure), and you can even take a peek of how monstrous the ogre behind the food stories over the past 7 years look like! Follow me on Instagram for quicker interaction and up-to-date on my whereabouts, or you can just message me for recommendations (please let this be both ways, as I need tips on my food hunt as well). After this week, this nomad lifestyle in Hong Kong will gradually be coming to an end ….. and I will be moving in to my new place starting October. Let’s hope that Internet connection set up is flawlessly rapid, and I can finally re-establish my passion to write. *Btw, the tremendously hazy weather in Klang Valley is really killing my creativity (ha-ha). 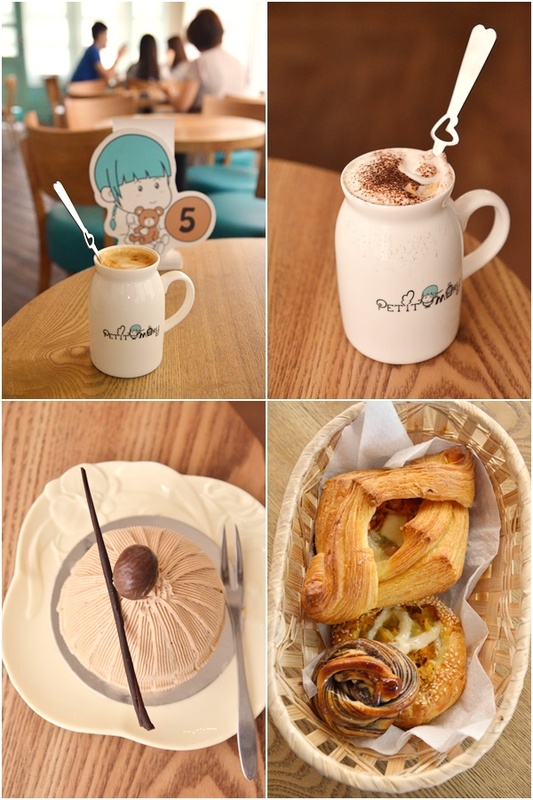 So, no food review today but do remember to stay hydrated (teh tarik, white coffee and all …. these beverages have diuretic effect though), indoor as much as possible, and pray that the Malaysia Day celebration in two days’ time will be a cause for joy, not a sea of REDs. This article was first published in the Malay Mail Online. Time to wake up dear Malaysians, and smell the flowers? Lately social media users in Malaysia (and possibly beyond) have been assaulted by the barrage of ridiculous and extremely frustrating headlines dominating the news feed. Short of throwing tantrums and taking a defensive stance, sometimes I wish things would just get better; rather than focus on politics, we should come together as Malaysians to stand strong against the weakening economy, and brush aside the notion of a nation divided by skin colour. So when the going gets tough, it pays to seek solace in a quiet corner of a café and let slow jazz tunes, indie pop or ambient music soothe the troubled soul. This article was first published in The Malay Mail Online. Click HERE to read it. Happy Saturday dear readers, wherever you are. The weather in Hong Kong this week started unbearably warm, and then gradually turned to a chilly weather; gusts of wind blowing in the earlier hours of the day and ultimately culminating in a Red Storm warning earlier this morning. Somehow, adapting to life in Hong Kong takes more than just adjusting to the food, people and culture; the weather (especially tropical storms and cyclones during summer) exerts some form of stress to the everyday life of a Hongkie as well. To me? It sets the pace for a decision to either embark on a food hunt outdoor on foot; or within shopping malls. Oddies was the last stop for today; I decided to write in reverse, or in no particular order in fact, for this should be the easiest to write. 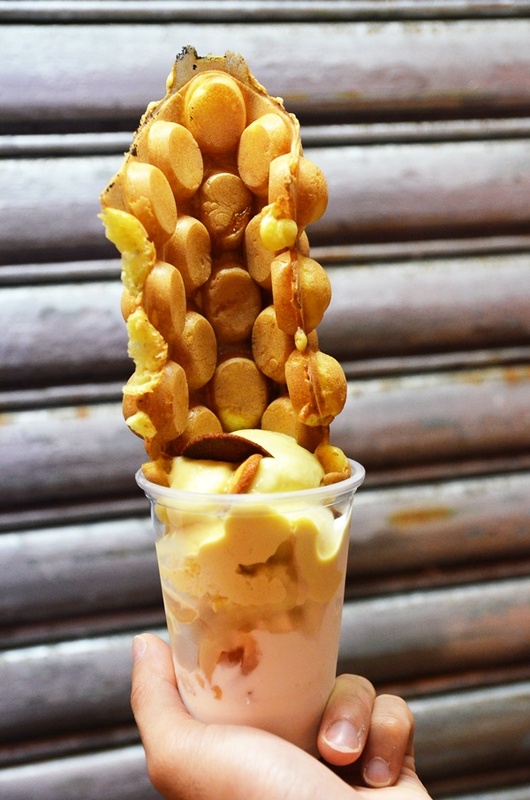 And somehow less effort to entice or coerce you into trying this the next time you are visiting Hong Kong for instance. Or a recurrent visit. 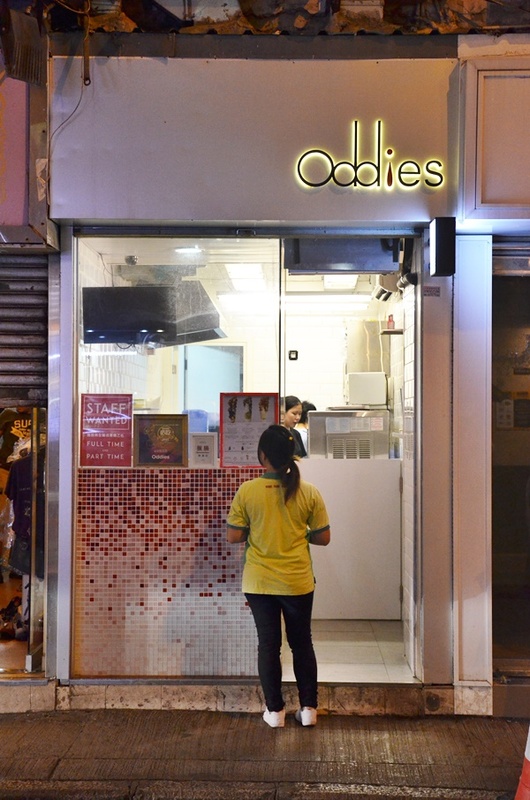 Oddies combines a sweet tooth soul’s best dreams – of Italian low fat gelato and Hong Kong classic eggettes or egg waffles, also known as ‘gai dan jaai’ in Cantonese. 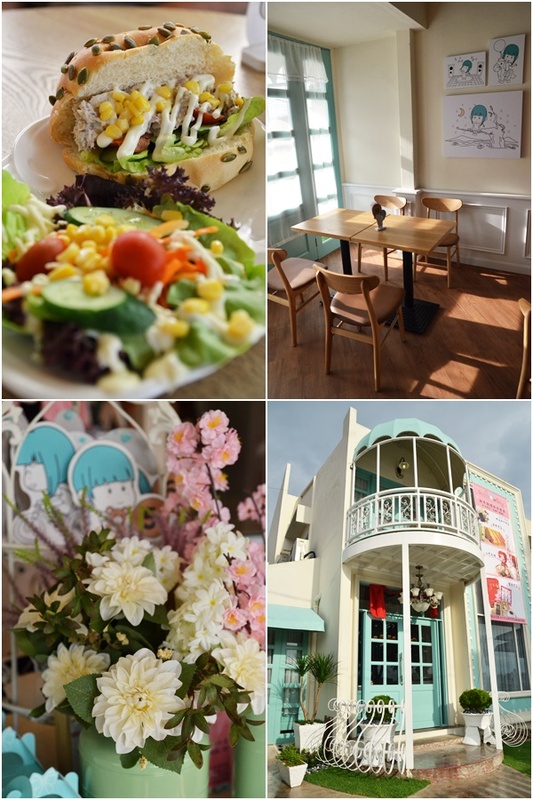 But instead of haphazardly/tragically marrying the two; the brains behind Oddies decided to come up with funky eggettes flavours like black sesame mocha, brownie and chocolate chip, and even weirder fantasies like Chinese sausage, vanilla rice pudding and Mediterranean. They rotate the selection every now and then, at least that was what I gathered from a fellow Oddies follower who stays in Wan Chai. Tonight; there are Night Wolf (a mouth-watering concoction of caramelized banana ice cream, passionfruit panna cotta and brownie and chocolate chip eggettes), The Mob (primarily macha ice-cream, apple yuzu jelly and black sesame mochi eggettes) and what we shared was the Loner; a slightly sweet and tangy combination of fresh lychee, low fat milk gelato and Taiwanese pineapple pastry eggettes. In short, the waiting took slightly more than 5 minutes (only 2 pax in front of us; this being a rainy day explained that), but the walloping session; of finding shelter under some canopies took slightly more than 3. Or maybe under 3. We for sure did not keep track. 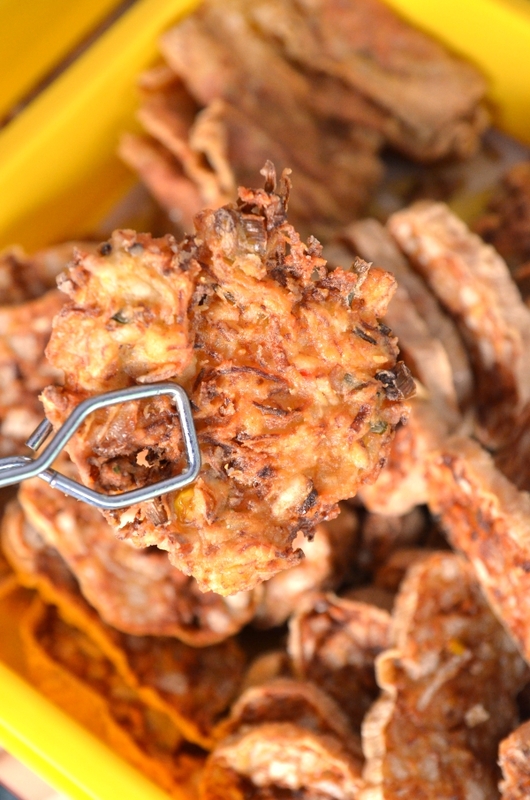 Come here; find out for yourself whether this is worth the hype. Take the MTR to Wan Chai station, exit A3 and walk for about 5 minutes towards the east along Wan Chai Road. This is some what off the main road. 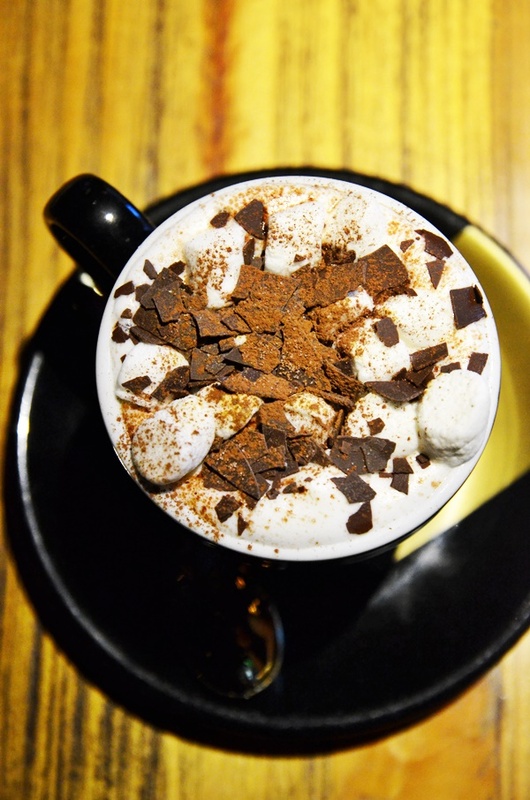 Babycino (HKD40/MYR20) – Frothy steamed milk (caffeine-free) with chocolate flakes, powder and bobbing pieces of marshmallows. Two weeks in Hong Kong. My second weekend here, and things started to become more familiar, adjusted myself to the not-so-subtle manner of the locals speaking their mind (not a bad thing, really), the luxury of individual space is almost non-existent; bumping into a stranger seems unavoidable but yet not frowned upon unless you’re going at a breakneck speed and the size of a truck, eating between proper meal hours is entirely acceptable, and ordering from the highly extensive menu (let’s not talk about ala carte, the sets alone would make your eyes wander and the pressure to cope with the high human traffic ain’t helping either). I cannot say that I do not miss the casual roti canai, vadai and frothy teh Tarik for breakfast. Nor do I not miss the punchy curry noodles on a weekend in Ipoh. But Hong Kong is no doubt a foodie haven (one fact that I have no issue vouching or verifying; from the previous almost annual visits! ), mixing a plethora of cuisines within the same neighbourhood; Wan Chai in particular has been one of my preferred spot to hunt for grubs. 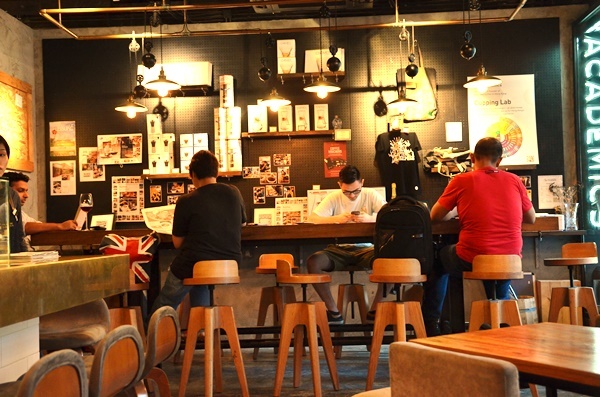 The Coffee Academics looks just like any other hipster cafes in Malaysia; and they do take their coffee seriously (read their About Us page for more information); complete with a large space dedicated to roasting their specialty coffee, and coming up with creative concoctions (some even seasonal) to keep up with the times.